Hardwood coming your way! Yo BEECH FUCKYOULAH to be exact! FLABSLAB has a soft spot for all things wood from his personal upbrings. 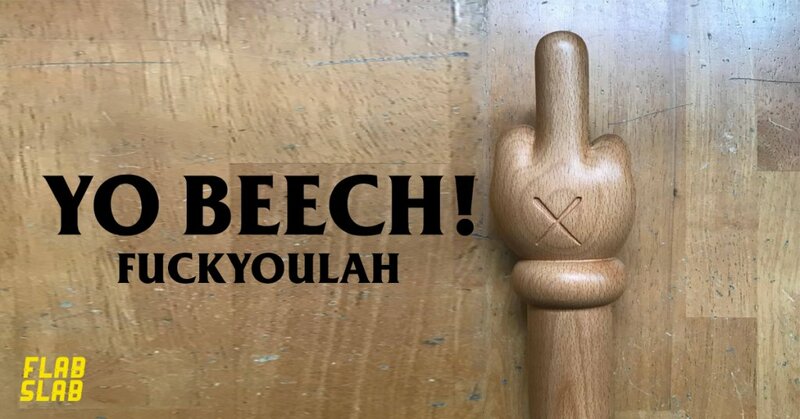 The already available FUCKYOULAH Pain Edition resin sculpture which was a piss-take on KAWs or Micky Mouse middle finger (debatable) now gets made into Beechwood all hand milled for your pleasure. Don’t worry hypebeast you can shove this up your asses as FLABSLAB has guaranteed no splinters included. If you’re prudish, look away now. Fuckyoulah is our usual way of greeting friends and foes alike. We’ve now made it into a piece that is dedicated to all the hypebeasts of the world. Who would you give the middle finger? HA. No release date but it should be soon judging from the photos from the workshop. Stay tuned for further updates. Personally, I would’ve like to see the pool of blood like the PAIN edition but you never know FLABSLAB might bend over and add them on (highly unlikely, that Lefucker). Looking for the PAIN edition? Click on the banner below. http://www.flabslab.bigcartel.com/ for more Fuckyoulah karma.